Several items in the news got our blood boiling this morning, so we spent most of our Memorial Day afternoon doing the jigsaw puzzle pictured above, “Deer Cove Market.” It’s one of our favorites. We had to do it with a cat wandering around on top of it, trying to sit in the box, bumping her head into our faces, and providing a level of difficulty the manufacturers had not anticipated. Thanks so much, Robbie. But she means well; and anyway, we did manage to finish the puzzle. Feeling ever so nice and calm now! 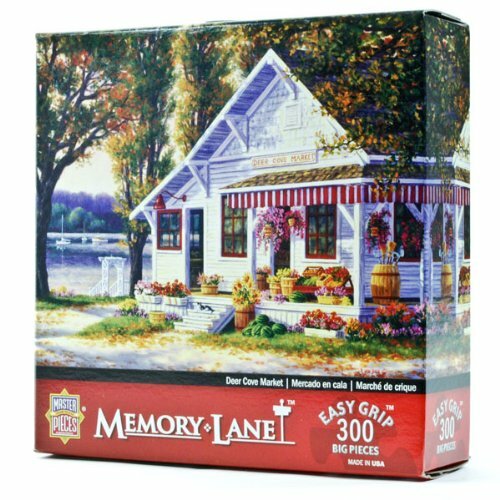 This entry was posted on Monday, May 28th, 2018 at 4:12 pm	and tagged with a personal note, Deer Cove Market, jigsaw puzzles, Memorial Day 2018, my family and posted in Just for Fun. You can follow any responses to this entry through the RSS 2.0 feed. There are any number of things you can’t do in any apartment with two cats. A great big jigsaw puzzle is one of them. What a nice time for the Memorial Day weekend. That picture reminds me of my Aunt Lillie’s old home, only hers was larger, but same style. I always loved going there. If there was a picture I could actually enter and visit, it’d be that. Looks like a nice house with that picture! I’m not very good with jig-saw puzzles – I blame it on my astigmatism. My wife is very good at it, so maybe I am just intimidated.